A deeply-rooted nexus of politicians, businessmen and bureaucrats in Nepal and Malaysia have looted more than Rs5 billion over the past five years from vulnerable Nepali migrant workers desperate to seek work in Malaysia. Nepal’s Labour Minister Gokarna Bista is trying to dismantle those involved in the exploitation by cracking down on several Kathmandu-based companies set up to extort fees from overseas contract workers. In Malaysia itself, the newly-elected Prime Minister Mahathir Mohammad has also launched an investigation into the previous government’s involvement in profiting from migrant workers. The scam involved powerful Malaysian businesses with close links to ministers and officials in the Barisan Nasional coalition of former Prime Minister Najib Razak and implemented by their agents in Kathmandu who had contacts with influential politicians and bureaucrats in Nepal. 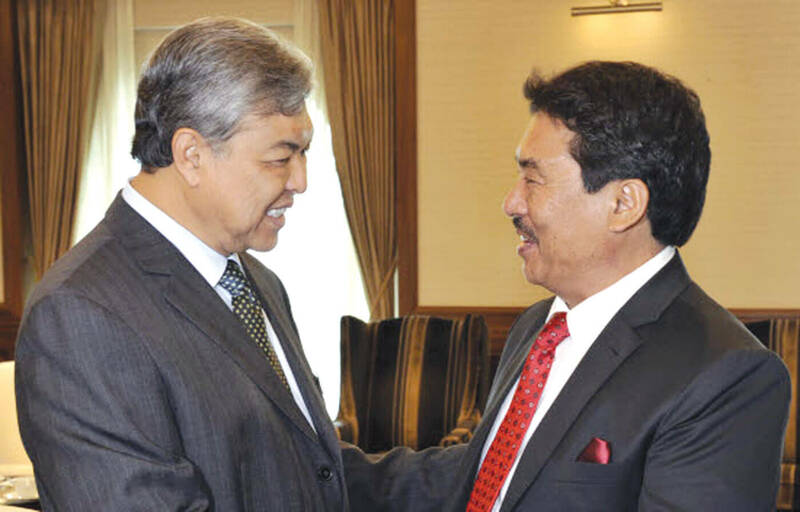 It all started five years ago when Malaysia’s Home Minister Ahmad Zahid Hamidi outsourced a private company (Ultra Kirana Sdn Bhd) which required Nepali migrant workers to apply for work visas through a Kathmandu-based affiliate, Malaysia VLN Nepal. The agency charged Rs3,200 from every Malaysia-bound Nepali worker, and collected Rs 1.95 billion from more than 600,000 workers between September 2013 and April 2018. Then in July 2015, Malaysia made it mandatory for all Nepali migrants to undergo a biometric test. The Malaysian government hired Bestinet Sdn Bhd, a tech firm run by Malaysian Home Minister Hamidi’s brother-in-law Amin Bin Abdul Nor, for biometric health screening. Minister Hamidi’s brother Abdul Hakim Hamidi and ex-Malaysian Environment Minister Ajmi Khalid also reportedly owned shares in Bestinet. Bestinet partnered with Nepal Health Professional Federation (NHPF) to carry out biometric screening through 39 medical centres which charged Rs4,500 from each migrant worker for biometrics. 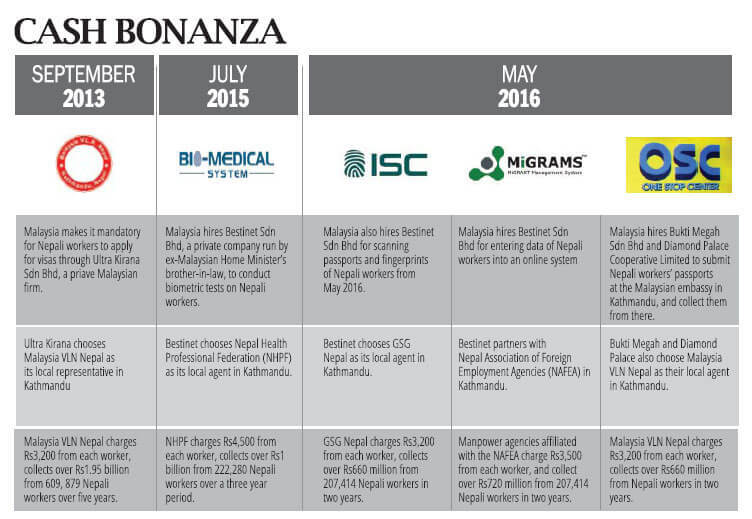 Bestinet and NHPF have already collected over Rs1 billion from over 200,000 Nepali workers. Previously, migrant workers could have applied for visas independently or through any manpower agency . They could get a visa for just Rs700. They could get medical tests from any of 200 government-approved health facilities. But after Malaysia required private companies for visa processing and biometric screening, workers were forced to pay much more. The real scam involved the lack of transparency in Malaysia and in Nepal on the choice of the private companies hired to facilitate this process, which ended up fleecing workers. While in Malaysia the companies were partly-owned by relatives of politicians, in Nepal bureaucrats and politicians benefited from kickbacks for sanctioning the new system. Fees were added on arbitrarily, and all involved in the syndicate in the two countries divided up the profits. For example, the Rs3,200 visa processing fee did not cover all visa-related costs of a migrant worker. In May 2016, Malaysia hired another private company, One Stop Centre (OSC) to collect visa forms and passports and drop them at its embassy in Kathmandu. The OSC chose the same Malaysia VLN Nepal for this job, which added an extra fee of Rs2,800 from each applicant. Bestinet has also been allowed to charge each migrant worker Rs3,200 just for scanning passports, fingerprinting and an additional Rs3,500 to upload the data online. Bestinet’s Kathmandu-based agent, GSG Nepal, scans passports and fingerprints for all Malaysia-bound migrant workers. Bestinet in turn collaborated with labour recruitment agencies in Kathmandu and has so far collected over Rs1.3 billion in fees for passport and fingerprints scanning, and online data entry. Tallied together, the Malaysia government and companies backed by powerful Malay politicians have, in total, taken more than Rs5 billion (US$ 450 million) from over 600,000 Nepali workers between September 2013 and April 2018. Nepali politicians, bureaucrats and businesses were directly colluding with their Malaysian counterparts in cheating the workers. There are over 600,000 Nepali workers in Malaysia, and their remittances help sustain Nepal’s economy. The arrangements have been put into place on an ad hoc basis, without transparency and in the absence of any bilateral agreements between the governments of Nepal and Malaysia. Some of the companies managing migration in Nepal do not even have government approval. Nepal’s Labour Ministry was initially reluctant to accept Malaysia’s proposal to introduce biometric systems, arguing it would allow certain medical centres to overcharge migrant workers. But those lobbying for biometrics were so powerful that the ministry had to approve the system as a ‘pilot project’ for six months. But long after the six months were over, Bestinet and the NHPF continued with biometric system with no interference from the government. In January 2015, Parliament’s International Relations and Labour Committee instructed the government to terminate the biometric system. It also directed the government to ask Malaysia to first make biometric test mandatory for migrant workers from all 14 countries that supply labour to Malaysia. It also ordered that biometric tests should be less expensive by ending the monopoly of a handful of selected medical centres. The Parliament committee, however, reversed its decision after its Maoist Chair Prabhu Sah went on a junket to Australia paid for by the Nepal Health Professional Federation in which he was accompanied by NHPF’s Kailash Khadka. In June 2016, a committee led by Joint Secretary Govinda Mani Bhurtel recommended that the government prevent private firms from overcharging Nepali migrants. But Labour Minister Deepak Bohara trashed the report and himself flew to Kuala Lumpur to ‘study the problem’ the following month. 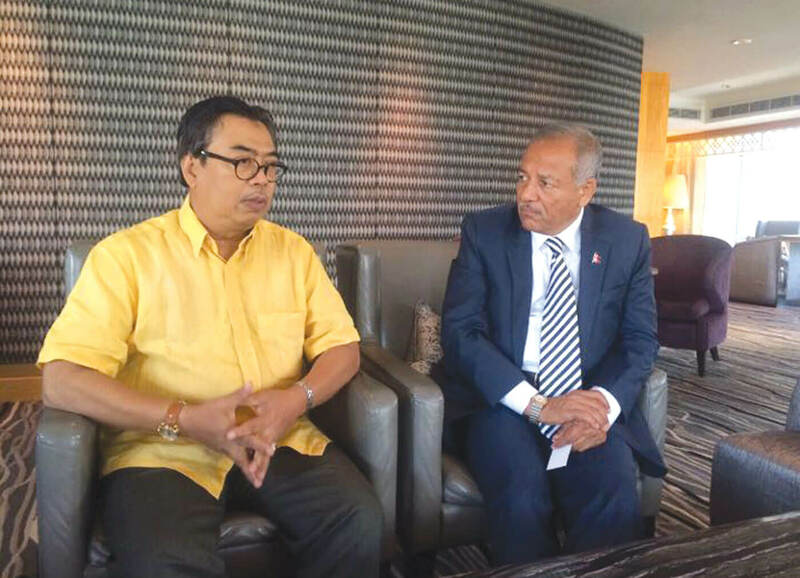 He met Malaysian Home Minister Hamidi’s brother Abdul Hakim at the Hotel Oriental Mandarin in Kuala Lumpur. On his return, Bohara took no action against Bestinet. In Malaysia itself, Prime Minister Najib Razak and Home Minister Hamidi were slammed for hiring private companies to do what the Immigration Department should have done. Razak’s party lost the elections in May mainly because of allegations of massive corruption. Before Malaysia-bound Nepali migrant workers were forced to undergo expensive biometric tests from July 2015, they used to go to for normal health check-ups at any of the 200 health facilities accredited by the Nepal government. But a significant number of workers who got a clean chit of health from Nepali medical centres were found to be ‘unfit’ in tests in Malaysia and immediately deported. Medical centres in Nepal licensed to examine the health of migrant workers were seen to not meet international standards. This was the excuse used to push the biometric system. Those who lobbied for the biometric system had promised Nepali migrant workers that they would not have to undergo another test in Kuala Lumpur if they were declared ‘fit’ in a biometric test in Kathmandu. However, the 100,000 Nepali workers who go to Malaysia every year also have to undergo a separate expensive test conducted by the Foreign Workers Medical Examination Monitoring Agency (FOMEMA). More importantly, the percentage of Nepali migrant workers who pass health tests in Nepal but fail them in Malaysia has also not decreased. Last year, more than 9,000 Nepali migrants were declared ‘unhealthy and unfit’ by the FOMEMA, and were sent home. Saroj Sarki of Chitwan is one of them. He spent more than Rs120,000 to go to Malaysia, passed the health test in Nepal, failed it in Malaysia, and was immediately deported. Sarki filed a complaint against the Nepali recruiting agency, but has not got his money back. The Labour Ministry has received more than 200 complaints filed by those who passed the health test in Nepal but failed the FOMEMA test in Malaysia. No action has been taken against some of the 39 private medical centres chosen by the NHPF which were responsible. In May, police arrested 40 businessmen, including Malaysia VLN Nepal Chief Ram Prasad Shrestha, for illegally charging Nepali migrant workers for visa processing, biometric and online data entry. Shrestha, who was later released along with 39 others on bail, told police that he was just an agent responsible for sending fee money collected from migrant workers to Malaysian companies in Kuala Lumpur and Hong Kong. He also informed police that his Kathmandu-based company would get a cut of Rs168 of every Rs3,200 visa processing fee and another Rs420 of every Rs2,800 passport collection fee. There is evidence that the companies used unofficial hundi channels to transfer cash to Malaysian parent companies. Malaysia’s Migrants Management System (MIGRAM) collected more than Rs720 million through Nepali manpower agencies between May 2016 and April 2018 through the illegal hundi system. The International Consortium of Investigative Journalists (ICIJ) has revealed that ex-Malaysian PM Najib Razak’s brother owns an offshore company in the British Virgin Islands which was used to stash ill-gotten wealth. The speculation in Kuala Lumpur is that it includes fees collected from impoverished and desperate Nepali migrant workers, that were illegally sent to Kuala Lumpur.